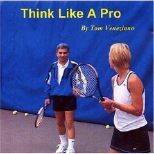 Tennis Server - Tennis Warrior - Is the Tennis Split-Step Frustrating You? Is the Tennis Split-Step Frustrating You? A split-step is when players take a slight jump on their toes when their opponent is about to hit a ball. This is done to stabilize their balance and to help players quickly move in whatever direction the ball is hit. If you watch pros play they are constantly bouncing with a split-step every time their opponent hits a ball, poised to spring in any direction. Should you do the same? Yes and no! The split-step is a technique that should not be forced on a player. Over time my students begin split-stepping on their own. The other day one of my students was occasionally split-stepping. I asked if she was aware that she was split-stepping. Her answer was "No, but I don't want to know about it!" Good answer. Since split-stepping was new she did not want to consciously think about performing the technique. 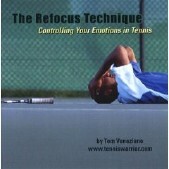 Playing tennis consciously can be the kiss of death! If you would like to practice the split-step in a drill situation or a private lesson, that's fine. Just do not over-think this mechanic. If you have yet to master the split-step, that is not a problem. This means you still have not hit enough tennis balls to know when to do what! Here is the secret. Performing a split-step is not a mechanic, but rather a feel or a sense. Once you have a feel the mechanic will work automatically. But feel what? A feel is a sense given to you by your sensory system that says NOW is the moment to split-step. At that point you perform an instinctive split-step and then move in the direction of the ball. It is all about feeling or sensing that moment! You may have heard that you split-step when you see your opponent hit the ball, but this is not true. Seeing the ball hit your opponent's strings and feeling that moment are two entirely different skills. Seeing the ball is related to your vision mechanics. Feeling is related to the exact judgment of that moment. To visually see the ball hit your opponent's strings does not mean you have good judgment. This explains why players get so frustrated with the split-step. They could swear they see when the opponent hits the ball, but they can never master the timing of the split-step. No ball judgment or feel for that exact moment! Here is an example of this concept that will help you to understand how feel works and what you can do to improve that feel. Let's suppose you are learning to drive and you have to drive around a car that is parked a little too far out. You are instructed to watch that car. You focus like a laser beam on the parked car but you slightly brush the car anyway. You think, "I kept my eye on the car and gave myself plenty of room, but still scraped the car." What was missing in this scenario? If you have not figured it out yet, the answer is judgment! You can watch the car all day long, but if your judgment is poor you could still hit the car. Why? Because you have not developed a feel or good judgment for the distance between the parked car and yours. Seeing the car, and having a sense of judgment of where the car is, involve two different skills. This is identical to watching the ball hit your opponent's strings. Seeing the ball hit and judgment of that moment are not the same. Just like seeing the car and judging the car's distance are not the same. So what can you do to improve your judgment of that moment? The same exact process that helps you judge car distance. Time and lots and lots of practice! One day your judgment of other cars improves. Once your judgment improves you automatically know what to do mechanically in order to avoid hitting other cars. Okay, now stay with me! In tennis, once you have improvement of your feel, sense or judgment of that exact moment your opponent is about to hit the ball, the split-step will mechanically happen by itself. That's right! Just as in the car scenario, you will know what to do mechanically when that moment arrives. This is why I said you can practice the split-step but do not over-think the technique. When the time is right, the technique will show up. No need to stress out about developing this mechanic. Just play and practice with your normal game and one day (voila!) you will be split-stepping.